Yesterday saw the announcement of a new all-gal fighter coming from SNK for the PS4 and Nintendo Switch. SNK Heroines: Tag-Team Frenzy sees some of the studio's famous warriors team ups for glamourous punch-fests. A limited edition box-set has also been announced. The Diamond Dream Edition will include a copy of the game, on PS4 or Switch, along with a whole host of extras. These include a hardcover art-book, a double-disc soundtrack CD and a selection of pin badges. 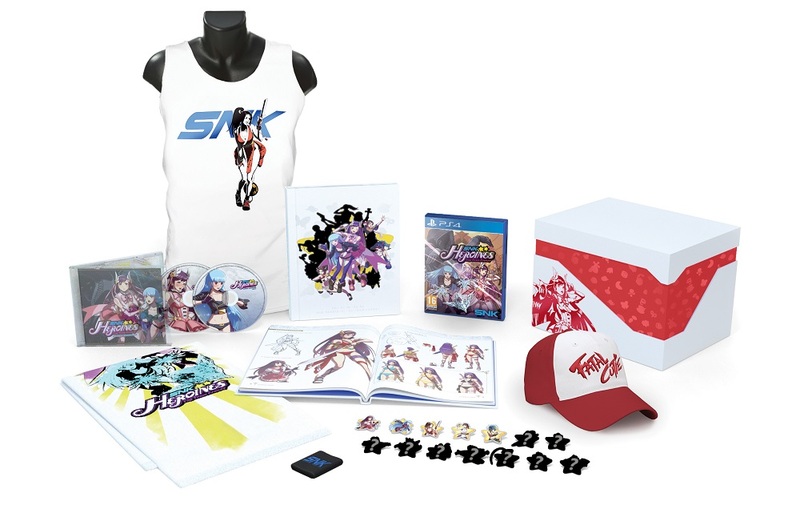 Also included is some amusing clothing apparel; a tank-top featuring Mai Shiranui, a sweat-band (because it's 2004) a towel (go figure) and a replica of Terry Bogard's legitimately iconic hat, except instead of saying "Fatal Fury" it says "Fatal Cutie." I WANT that. In Europe and the U.S. the Diamond Dream Edition will be the only way to purchase a physical PS4 copy of SNK Heroines, although it will also be available as a downloadable title. The limited edition set is available for Pre-order on the NIS America store, priced at $120. In details pertaining to the game itself, SNK Heroines: Tag-Team Frenzy is a 2v2 fighter which will feature a "generous" roster of classic characters, (notice that there are fourteen pins in the above image, plus the silhouettes in group image). You defeat your opponent by reducing their HP and then activating your "Dream Finish" Super. Match winnings can then be spent on customisation items for your favourite characters. Each character will have up to 100 different available accessories each at launch. The game appears to be emphasising a simplistic-but-fun style over the deep-rooted tech of most fighting titles. You can see in the trailer that you appear to have a green meter for your HP and also a pink meter for your specials/tags. Said specials can be activated with mere button presses, and various items can be utilised in battle to give you an edge over your opponent. The game will feature online modes and support for 1-4 players. SNK Heroines: Tag-Team Frenzy launches on PS4 and Nintendo Switch this Summer.